Another quick layout I made on National Scrapbook Day. 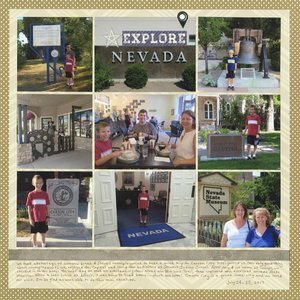 This is from our mini trip to Carson City last summer. One interesting thing to note about the layout: I used a photo of a building with NEVADA on it as the base for my title. I added the EXPLORE sticker (actually cut down from EXPLORER), then accented with the star and geotag stickers. It's a very simple layout, but I'm happy to have 9 photos and a bunch of journaling that, together, tell a pretty complete story. Loveeeeee how you used the photo as the title! That is GENIUS!!!!! !